As a business owner and blogger I rely on certain apps to optimise my workflow and keep the creation process running smoothly. These are the five major tools and applications I rely on daily to curate, edit, and produce the content for this blog; they provide me with the ability to create content within a productive structure and organised workflow, and enable me to protect and share this content once it's available online. Everyone needs to be using a password manager, everyone. Whether you run a business, a blog, or just have a couple of accounts online, you need a password manager to protect yourself. Not convinced? Vox explains why you should stop memorising your passwords. Even though I knew this was a top priority especially as a business owner with numerous accounts and login details, it took me well over a year to make the switch and I’m still chastising myself for not doing it sooner. It’s so easy to do, completely fuss free, and your online life is secure; no more remembering passwords or getting locked out of accounts. I’ve explained in detail how I use Evernote for blogging; I can’t recommend it enough as a workflow tool for organising references, drafting posts, and publishing content. Not only do I use Evernote to write blog content, I also use it to compiles notes and write drafts for my ebooks including The 5-Step Method for Decluttering. Evernote makes the entire process of creating content, from start to finish, fluid, intuitive, and methodical. There are so many different ways you can use it; unlike other apps, Evernote provides a flexible structure that accommodates the way you like to work. 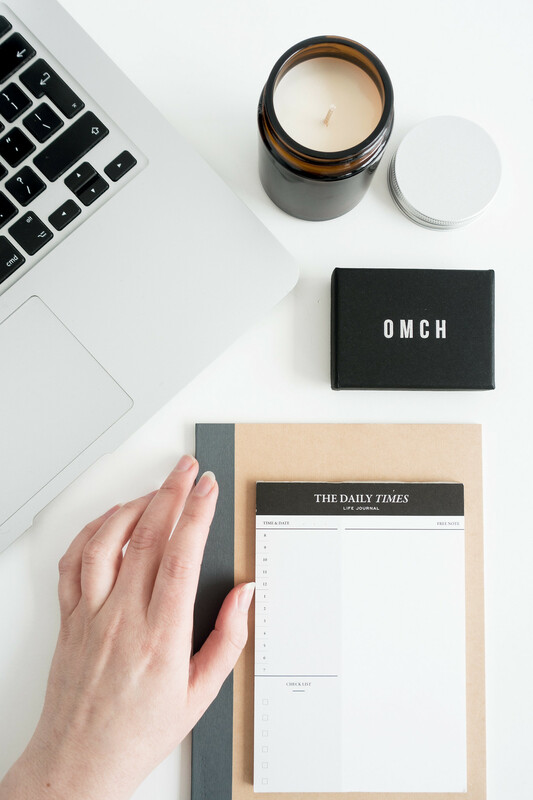 Having a flexible calendar app where I can switch between multiple schedules and view specific calendars is essential when running a business and a blog. Fantastical allows me to keep all my important dates in one place, plan ahead, set reminders for specific events, and switch between multiple calendars without causing disruption or confusion. Keeping everything together in a beautifully designed app helps maintain a healthy workflow. I use Fantastical as an editorial calendar for the blog, for storing personal dates and reminders, and to plan and schedule future events for my business. For anyone producing vast amounts of content, specifically large files like photographs, storage is always a concern. Google Drive is the place when I store all my photography files, backup data such as my shop and blog themes, invoices, catalogues, and media kits. Using Google Drive for storage allows me to access this content no matter what computer I’m using; a single login and I have access to all my files and information. I move as much as possible from my desktop into Google Drive folders using nested folders and tagged files for easy searching. For scheduling content, Buffer can’t be beat. I use this app for scheduling all the content for both the blog and the shop including Tweets, Instagram posts, Facebook updates, and occasionally even Pinterest. Scheduling is a business owner’s best friend and almost everything I share online gets run through Buffer. It just makes running a blog and shop more organised and less stressful. Buffer's calendar view makes it easy to plan ahead and there’s a quick ‘rebuffer’ option for repeating previous posts, excellent for keeping that schedule topped up. You can view analytics to see what content was the most (or least) popular and create flexible schedules for different platforms.